The geography of Virginia has shaped both the history and economy of the state. It brought settlers and wars to the region, the federal capital to its edge, and its harbors facilitated commerce and the twentieth-century military buildup. Terrain and climate have determined the nature of the state’s agriculture and industries. 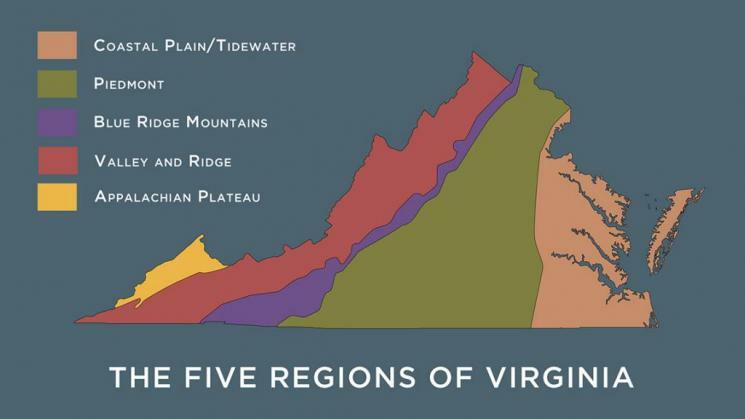 To help understand this setting that has been critical to life in Virginia for thousands of years, geographers have identified five physical regions in the state: the Coastal Plain (Tidewater), Piedmont, Blue Ridge Mountains, Valley and Ridge, and Appalachian Plateau. To illustrate these five regions, selections from the display of landscape paintings at the Virginia Historical Society are pictured here. A low-lying Coastal Plain spans the eastern seaboard from New Jersey to Georgia, extending westward from the ocean to a point where the flatness of the landscape stops and in Virginia the terrain rises 300 feet above sea level. As with all of the Virginia regions, its Coastal Plain was sculpted by hundreds of millions of years of geological evolution. At its core is a solid rock foundation formed 250–500 million years ago. The surface is covered by a thick wedge of eroded clay, sand, and gravel—two thirds of which was carried eastward by Virginia’s many rivers. When sea levels rose and fell with the repeated melting and growth of large continental glaciers, this plain was alternately submerged and exposed. During the last Ice Age, 25,000 years ago, sea levels were dramatically low and the Coastal Plain extended far eastward—fifty miles or more than it does today. When the ice sheets melted, 5,000–6,000 years ago, the Chesapeake lowland filled to form a bay, and the Coastal Plain slowly uplifted. “Piedmont” is a French word meaning “foot of the mountains.” The American Piedmont extends from Pennsylvania to Alabama. 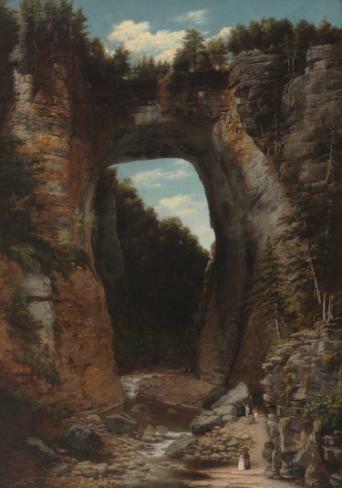 Virginia’s Piedmont is separated from its Coastal Plain by a “Fall Line,” where rivers, small waterfalls, and rapids cascade or “fall” off hard, resistant rocks as they make their way to the ocean. Those rivers give the state its unique geography that has strongly affected its history and economy. The “Fall Line” runs through the port cities of Alexandria, Fredericksburg, Richmond, and Petersburg—beyond which the water is too shallow for deep-bottom ships to navigate. The Piedmont is Virginia’s largest region. It is rolling hill country that gently rises to 1,000 feet, then doubles that height at the foothills of the Blue Ridge Mountains, where its topography becomes more rugged. The region’s bedrock—part of the ancient Appalachian mountain belt—is composed of a variety of rocks formed 541–2,500 million years ago, under extreme pressure and heat. Its geologic history is complex because during that time the bedrock was moved—some of it from outside of North America—by the shifting of oceans. This bedrock is covered by a twenty-meter blanket of deeply weathered rock (called “rotten rock”) that has been chemically changed by the Piedmont’s humid climate. Outcrops (exposed rock) are rarely found. The Blue Ridge region runs nationally from southern Pennsylvania to the northern tip of South Carolina and Georgia. It is a rounded mountain range that looks blue from a distance. Its rugged appearance resulted from collisions there long ago of the most powerful geological forces. In Virginia, the rocks that form its core date from 1,000–1,600 million years ago; the oldest rocks in the region are more than a billion years old! Mountains were formed when rocks were pushed westward over the top of rock layers by an enormous force that was generated when two land masses to the east were squeezed together. Those two land masses later were ripped apart to become the continents of North American and Africa, an ocean formed, and as its sea level rose, sedimentary rocks were deposited in the Blue Ridge. That was 700–750 million years ago. The folding and faulting of this process of mountain formation left rocks deformed through heat and pressure. The continents were shoved together and split apart many times 245–540 million years ago, causing rocks to be deposited on the eastern side of the Blue Ridge. The Blue Ridge Mountains are covered with thick forests and rise to elevations more than 4,000 feet in the central and northern part of the state. Virginia’s southern Blue Ridge is a broad, relatively flat region, but the tallest peak in Virginia, Mount Rogers, is there (5,729 feet high). Virginia’s Valley and Ridge region is part of a gigantic trough that runs from Quebec to Alabama and is called “the Great Valley.” Virginia’s portion is distinctive for its size (greater than that of any other state); its narrow and elongated parallel ridges (3,000–4,000 feet high); flat, lush valleys with gentle topography; and caves, caverns, and hot springs. The region developed its identity when bands of sedimentary rock that had been formed 252–541 million years ago were disturbed by a continental collision that produced a fold and thrust belt. Bands of rocks were caused to fold and move westward along thrust faults. They eroded differently, causing both ridges and valleys to be created. Sand and gravel washed down from the mountains of the Blue Ridge region; the sand and gravel in time turned into rock. At the end of this complex evolution, the surface of the Shenandoah Valley in central and northern Virginia emerged as both picturesque and fertile. Sandstone in the easternmost portion was overlain by carbonate deposits that in time produced caves and caverns in the subsurface. The southwestern portion of Virginia is part of the great Appalachian Plateau that stretches from New York to Alabama. Virginia’s plateau is the smallest of the state’s five regions and contains only three counties (Wise, Dickenson, and Buchanan). The visible slope at its eastern edge gives the impression that it is a mountain range, but instead it is an eroded plain of sedimentary rock that has a high elevation of 2,000 feet above sea level—higher than that of the Valley and Ridge region. Thrust faults from the Valley and Ridge formed huge folds of rock beneath the plateau that failed to reach the surface. What resulted was a hilly and rugged terrain, strongly dissected by stream erosion, with many valleys and some portions of flat land. The upper layers of the plateau are covered with forests and are rich in coal, natural gas, and petroleum formed 250–540 million years ago. Want to learn more about the regions of Virginia? 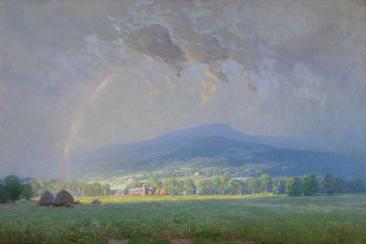 Visit our Landscapes of Virginia currently on display or read web.wm.edu/geology/virginia. This marshland along the Potomac River is an image of constancy and renewal. The region has not been changed since the colonial era, when George Mason developed parts of it into his plantation, Gunston Hall. It is now Mason Neck State Park and Mason Neck National Wildlife Refuge, a habitat for more than 200 species of birds and waterfowl. 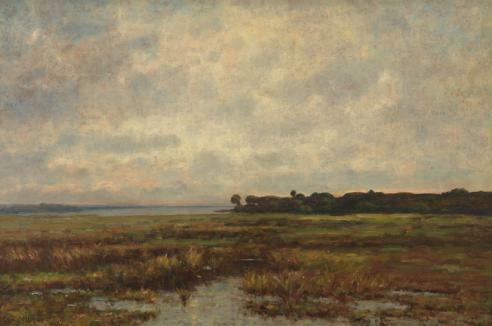 "Potomac Marsh," about 1890–1900, Max Weyl, 1997.178, Lora Robins Collection of Virginia Art, accession number: 1997.178. Hubert Vos was from Holland, where three centuries earlier the telescope and the microscope had been developed. He brought to Virginia the Dutch interest in perceiving and recording fact and discovering the rightness of nature. That appreciation of peaceful and simple rusticity resonates in the Valley. "Mossy Creek", about 1900, Hubert Vos, Lora Robins Collection of Virginia Art, accession number: 1996.28.7. Artist William Jameson includes in this image several of the distinctive characteristics of the Appalachian Plateau: its mountainous quality, forests, and varied terrain. At the same time, he provides evidence of both the beauty of the region and the abundant natural resources that shape its economy. "October at Tipple Mine no. 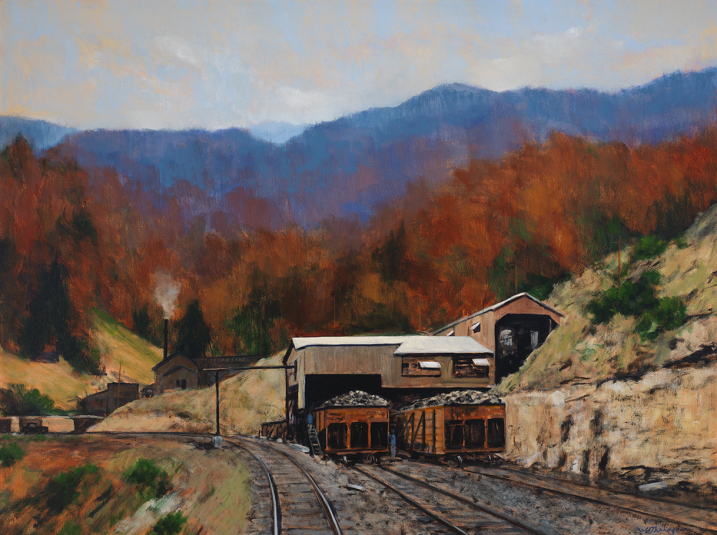 52, Dante, Virginia", 2015, William Jameson, courtesy of Warm Springs Gallery, Charlottesville, Virginia. "That part of America, now called Virginia"
Find out more about "That part of America, now called Virginia"